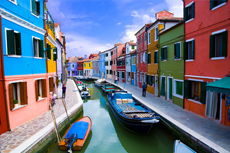 Visit the village of Burano, known for its brightly colored houses and exquisite handmade lace. A tour of the Lace Museum on the island offers a glimpse into the art and history of lace-making! Was actually Murano and. Burano. Thoroughly enjoyed. Overnight visit left p,entry of time to do our own thing as well. The demonstrations at both Borano and Morano were striking. Lovely island with lots of colorful houses; the lace is exquisite. Lovely island with lots of colorful houses; the lace is exquisite. Again, did not buy anything. Saw the lace-making, shopped, wonderful luncheon recommendation. Very pretty place, many little lace shops and places to eat and drink coffee. Wanted to see the world famous Murano glass factories; great demonstration. Wanted to see the world famous Murano glass factories; great demonstration. Sales people pressured most of us to buy something (great quality but very expensive). This beautiful picturesque town is underrated and not affected by tourism yet. This beautiful picturesque town is underrated and not affected by tourism yet. It&apos;s quaint features are like a magnet. Definitely a must see! Lovely little place but our visit was quite short as it was combined with a visit to Murano. Very good, enjoyed it very much, although the visit to the lace shop was a bit of a waste of time. no real lace making going on but nice stores and lace for sale. A nice little place with an interesting Lace museum. Awesome! Stay an extra day and hop on and off the water taxi along the canal. What a BEAUTIFUL island. I loved the colors and the lace and the people were so nice. Amazing place. I only wish we had more time there. We only had 45 minutes and it was not enough time. Five cruise ships in port and very difficult to move about after the recent flooding due to storms. No real tour..on our own which is all you need here. No real tour..on our own which is all you need here. the only reason we took this was because of the shortness of time. Otherwise go without a tour.